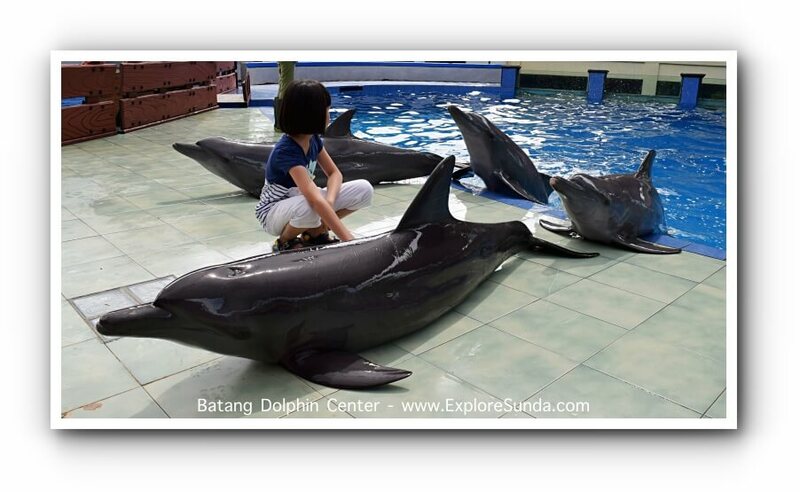 Batang Dolphin Centre is one of many units of Taman Safari Indonesia. 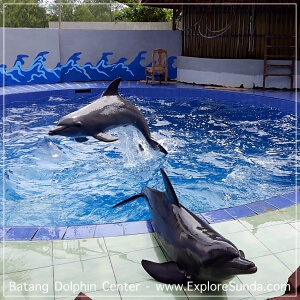 It is located in Sigandu beach, Batang, Central Java, the GPS coordinate is 6°52'56.0"S 109°45’10.8"E.
As the name implies, the main attraction here is the dolphins. 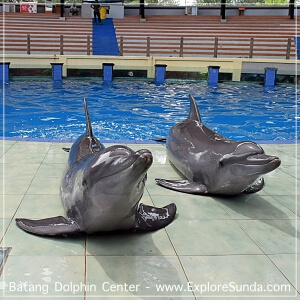 Batang Dolphin Center has two pools containing 9 dolphins: 8 males and 1 female. They were accidentally caught by fishermen in Batang. Then the fishermen gave them up to Batang Dolphin Center, since it also functions as a dolphin conservatory. Four of the dolphins are already well trained and perform routinely. The remaining 5 are still under training. They all live in two pools. The big one is for the trained dolphins. It looks like an aquarium with giant glass where we can watch them play under the water. Once we go upstairs, we can watch them jump and slide on to the platform. Supposedly, there are dolphins show during weekends. 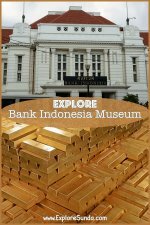 However, since it is a very low season, there were less than 10 visitors when we, from the ExploreSunda.com, visited. Hence, all shows are off. We could still take pictures with them though. Plus, it is fun to watch the dolphins play and interact with the staffs. I don’t think they intend to rehearse their performance, but they keep doing things they do during performance, such as jumping all around the pools, two dolphins swim together side by side, and they repeatedly jump from the pool and slide on the platform. During lunch time three dolphins keep singing to the staff who paint the pool’s wall, asking their lunch perhaps? 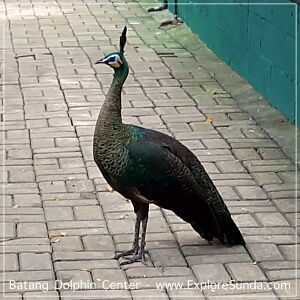 Since it belongs to Taman Safari Indonesia, there are other animals in Batang Dolphins Center. In front of the dolphin pools, there is a touching pool where visitors can touch the turtles. However, we only see them from a distance since the pool is dirty. Next is a short tunnel containing several aquariums. On the left side contains various snakes, while on the right side there are two big aquariums for sea fish as well as other sea creatures such as crabs. That’s the first time I saw a couple of albino catfish (patin albino). 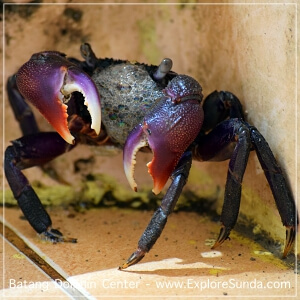 Then we could explore the Mini Safari, located besides the dolphin pools. Although they called it Mini Safari, I think it is more like a mini zoo, where the animals are all inside their respective cages. On one side there are cages of orang utan and leopard. The front area is covered with a glass wall so the animals are safe inside. Unfortunately, the glasses are dirty. There are two young orang utans there. Once they saw us they walk to the glass wall, press their bodies and face to the glass and look at us with a very sad face. Hence, I could only watch them for few seconds. The Mini Safari also has a bird dome where some species of birds can fly freely inside. Unfortunately, it was closed when we visited. 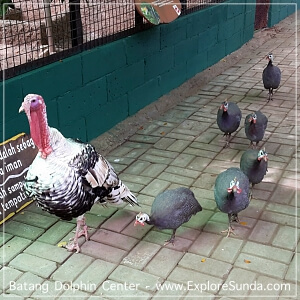 But, we met a turkey, several chickens and peacocks walking leisurely outside the bird dome. The peacocks are quite territorial, they are ready to attack us when we cross their path! 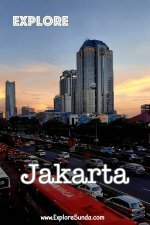 Should we walk further, we will see hippopotamus and crocodiles. There will be camel and elephant rides during high season. 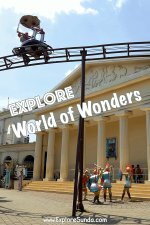 Similar to other Taman Safari Indonesia, Batang Dolphin Center also has a fun zone, where children can take a ride on mini train, flying elephants, etc. 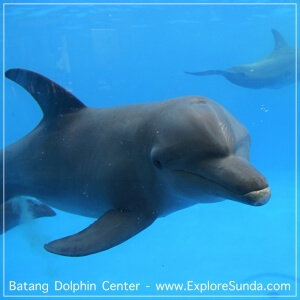 Since Batang Dolphin Centre is located in Sigandu beach, first we have to pay entrance ticket to Sigandu beach (Rp. 3,000/person). Then we pay the entrance ticket to Batang Dolphin Center (Rp. 15,000/person). There will be additional tickets if we want to take pictures with the animals or play in the fun zone.